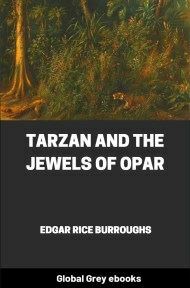 This is the eighteenth book in the Tarzan Series. 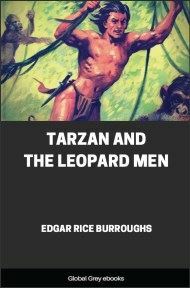 An amnesiac Tarzan and his monkey companion Nkima are taken by an African warrior to be his guardian spirits, and as such come into conflict with the murderous secret society of the Leopard Men, led by Gato Mgungu. 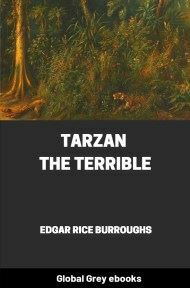 From America, a young woman arrives in the territory in search of a loved one presumed missing, and two young men (also from that country) come in search of ivory. THE girl turned uneasily upon her cot. The fly, bellying in the rising wind, beat noisily against the roof of the tent. The guy ropes creaked as they tugged against their stakes. The unfastened flaps of the tent whipped angrily. Yet in the midst of this growing pandemonium, the sleeper did not fully awaken. The day had been a trying one. The long, monotonous march through the sweltering jungle had left her exhausted, as had each of the weary marches that had preceded it through the terrible, grueling days since she had left rail-head in that dim past that seemed now a dull eternity of suffering. Perhaps she was less exhausted physically than before, as she was gradually becoming inured to the hardships; but the nervous strain of the past few days had taken its toll of energy since she had become aware of the growing insubordination of the native men who were her only companions on this rashly conceived and illy ordered safari. Young, slight of build, accustomed to no sustained physical effort more gruelling than a round of golf, a few sets of tennis, or a morning canter on the back of a well-mannered mount, she had embarked upon this mad adventure without the slightest conception of the hardships and dangers that it would impose. Convinced almost from the first day that her endurance might not be equal to the heavy tax placed upon it, urged by her better judgment to turn back before it became too late, she had sturdily, and perhaps stubbornly, pushed on deeper and deeper into the grim jungle from which she had long since practically given up hope of extricating herself. Physically frail she might be for such an adventure, but no paladin of the Round Table could have boasted a sturdier will. How compelling must be the exigency that urged her on! What necessity strove her from the paths of luxury and ease into the primeval forest and this unaccustomed life of danger, exposure, and fatigue? What ungovernable urge denied her the right of self-preservation now that she was convinced that her only chance of survival lay in turning back? Why had she come? Not to hunt; she had killed only under the pressure of necessity for food. Not to photograph the wild life of the African hinterland; she possessed no camera. Not in the interests of scientific research; if she had ever had any scientific interest it had been directed principally upon the field of cosmetics, but even that had languished and expired in the face of the fierce equatorial sun and before an audience consisting exclusively of low-browed West Africans. The riddle, then, remains a riddle as unfathomable and inscrutable as the level gaze of her brave grey eyes. The forest bent beneath the heavy hand of Usha, the wind. Dark clouds obscured the heavens. 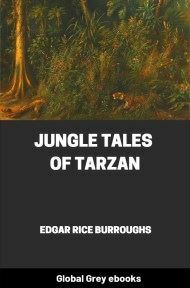 The voices of the jungle were silenced. Not even the greatest of the savage beasts risked calling the attention of the mighty forces of Nature to their presence. Only the sudden flares of the windswept beast-fires illumined the camp in fitful bursts that wrought grotesquely dancing shadow-shapes from the prosaic impedimenta of the safari, scattered upon the ground. A lone and sleepy askari, bracing his back against the growing gale, stood careless guard. 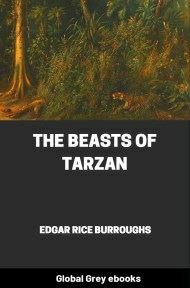 The camp slept, except for him and one other—a great hulking native, who crept stealthily toward the tent of the sleeping girl. Then the fury of the storm broke upon the crouching forest. Lightning flashed. Thunder boomed, and rolled, and boomed again. Rain fell. At first in great drops and then in solid, wind-sped sheets it enveloped the camp. Even the sleep of utter exhaustion could not withstand this final assault of Nature. The girl awoke. 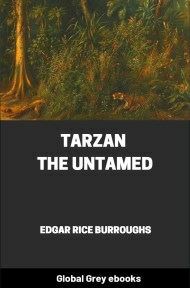 In the vivid and almost incessant flashes of lightning she saw a man entering the tent. Instantly she recognized him. The great, hulking figure of Golato the headman might not easily be mistaken for another. The girl raised herself upon an elbow. "Is there something wrong, Golato?" she asked. "What do you want?" "You, Kali Bwana," answered the man huskily. So it had come at last! For two days she had been dreading it, her fears aroused by the changed attitude of the man toward her—a change that was reflected in the thinly veiled contempt of the other members of her party for her orders, in the growing familiarities of their speech and actions. She had seen it in the man's eyes. From a holster at the side of her cot she drew a revolver. "Get out of here," she said, "or I'll kill you." For answer the man leaped toward her. Then she fired. Moving from west to east, the storm cut a swath through the forest. In its wake lay a trail of torn and twisted branches, here and there an uprooted tree. It sped on, leaving the camp of the girl far behind. In the dark a man crouched in the shelter of a great tree, protected from the full fury of the wind by its hoary bole. In the hollow of one of his arms something cuddled close to his naked hide for warmth. Occasionally he spoke to it and caressed it with his free hand. His gentle solicitude for it suggested that it might be a child, but it was not. It was a small, terrified, wholly miserable little monkey. 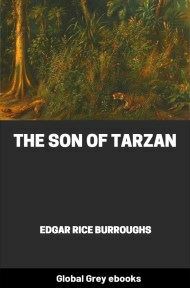 Born into a world peopled by large, savage creatures with a predilection for tender monkey meat he had early developed, perhaps inherited, an inferiority feeling that had reduced his activities to a series of screaming flights from dangers either real or imaginary.